This is one of the most beautiful games I've seen in a long time. I absolutely love the graphics, the motion, and the odd little creatures and items. The art for the ships is a big part of why I like this game so much. The chaotic twisting beams and pipes make the ship feel complex and massive, the way a space ship should feel. The character is just one of those pixel guys that looks right to me. Their porportions are nicely squat. And the relatively high number of animation frames for tumbling around in space is really immersive to me. I also love the environment art. Though it is basic, I like the way the ground wanders from bare surface, to some kind of pebbles, to bouldery. The little bushes and grass scattered around are nice. And I also just love the way they used the C64 palette. Anyways, interested to know what anyone else thinks. I know next to nothing about C64 games, so I'd be interested to hear if this game has similarities to any others. I think you mghta brought up Exile in the Discord when you first joined? I've never actually got very far. But I'd like to have a proper go at it one day. Actually I'd really like some kind of 8-bit comeputer, so maybe I'll combine these two dreams. 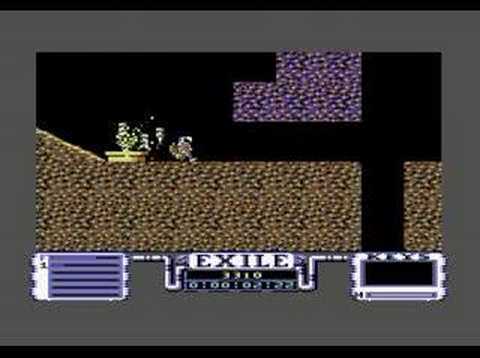 In the C64 one I really like the dirt and the pipes and the columns that almost like Greco-Roman or omething all being in one place. The brick tiles are really really lovely and ostentatious too. There's like an unstable/uncanny sense of time. Like you could be in the far future returning to a wasted earth, or some alternate timeline where the Romans built their empire underground. The C64 kinda seems like it's underwater with it's greyish palette. I also like it when games have their own title on screen. What do you like about the BBC Micro graphics? They are still pretty mysterious like the C64 version, but the colors are so bright it's kind of jarring to me. I'm always really impressed by peopel who can squash bright colours together. My 8-16 colour palette things are never this bold. The space ships are like beautiful Christmas jumpers. I rmeember reading a really interesting article on the game's develpment, and some of the techinical things they had to do. Both those articles are awesome. Thanks for the links. Have you played Waking Mars? I haven't got it yet, but it's supposed to be an adventure game like Exile and Metroid, but you navigate my manipulating the games ecology. So you feed plants and things. 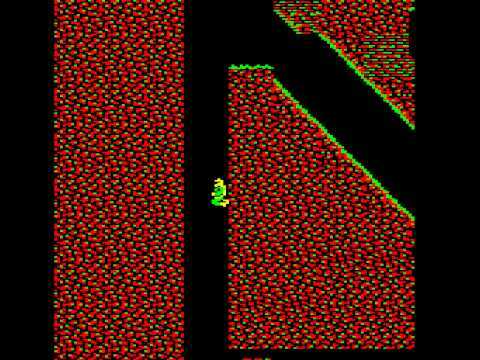 Watching the C64 video again reminded me of it--spaceman + little animals. I'm not sure if you jetpack round though You even jetpack round the caves.